This week, I planned a morning wedding celebration for my coworker and was looking for a breakfast dish that was easy to make in the slow cooker overnight. I thought of oatmeal because of the cooler Fall weather. I got a recipe for Steel Cut Oatmeal from a family friend who learned it from a whole foods cooking class hosted by a doctor's office. She and her husband were very focused on nutrition and wellness and I remember him talking about how much he liked this recipe. 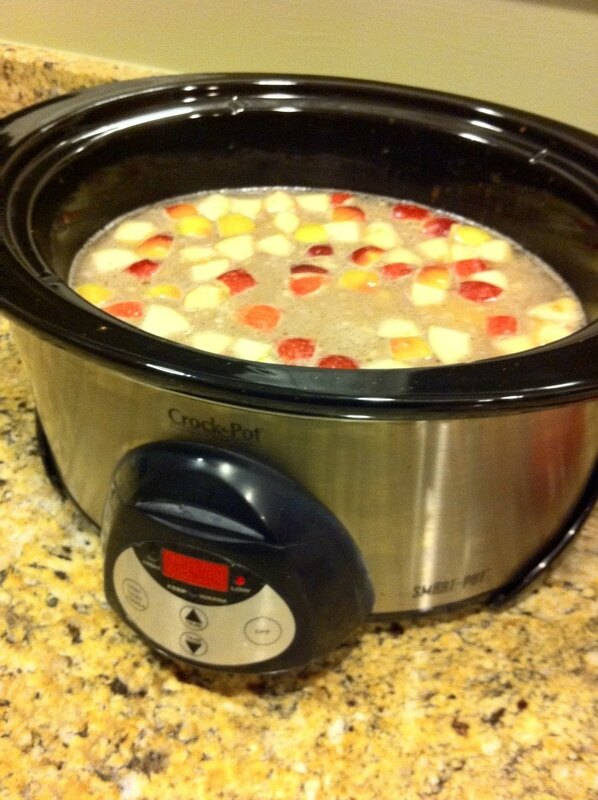 So I was glad she shared the recipe because I came home with an empty crockpot. The oats were gone at the end of the party and my coworker thought it tasted more like an apple crisp than a breakfast food! You don't need to add a lot of sugar to these oats because of the natural sugars from the fruit. Last night, I decided to make another batch for me and Aaron. And I have a slight addiction to oatmeal from the Au Bon Pain cafe in my office building so I'll bring the leftovers to work this week and save a few bucks! Aaron teased me and called it "porridge" but he liked it. The Overnight Apple-Cinnamon Oats are great for hosting house guests or a busy household with family members that get up at different times of the morning. Today it was so fantastic to get up and grab a bowl of oats while the baby was having a morning nap and I could eat before she woke up. You can put out spoons, bowls, napkins, and toppings for your guests or family to customize their bowls. 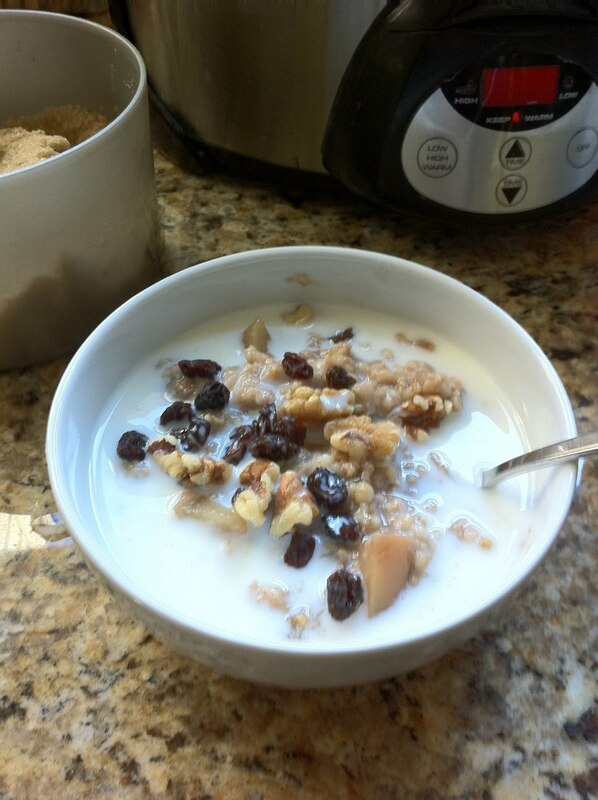 Steel cut oats because they are minimally processed have the most fiber and protein than other oat varieties. Dried fruit - such as raisins, apricots, cranberries, blueberries. You can find steel cut oats in the bulk bin at your local health food store such as Whole Foods (my fav!) or check out the Red Mill brand. They have a package sold at grocery stores nationwide. Preheat slow cooker to Low setting. When it's warm, use a the back of a spoon and push coconut oil around the slow cooker including the sides to prevent sticking. It WILL stick! It happened to me the first time I made it and my friend forgot to tell me about that part. Add oats and purified water. Then add mashed banana and chopped apples. Add in sea salt and spices. Stir. If you can get up early, stir the oats in the morning and make sure to change the setting to "keep warm" if it looks like you'll need the oats for the late morning. What's the difference between Steel Cut and Regular Oats? The whole grain is called an Oat Groat. Regular oats are more processed. The grain is sliced thin and flattened into flakes. Steel cut is a coarser type of texture because it's cut in pieces and not flattened. Check out this post comparing the different types of oats. 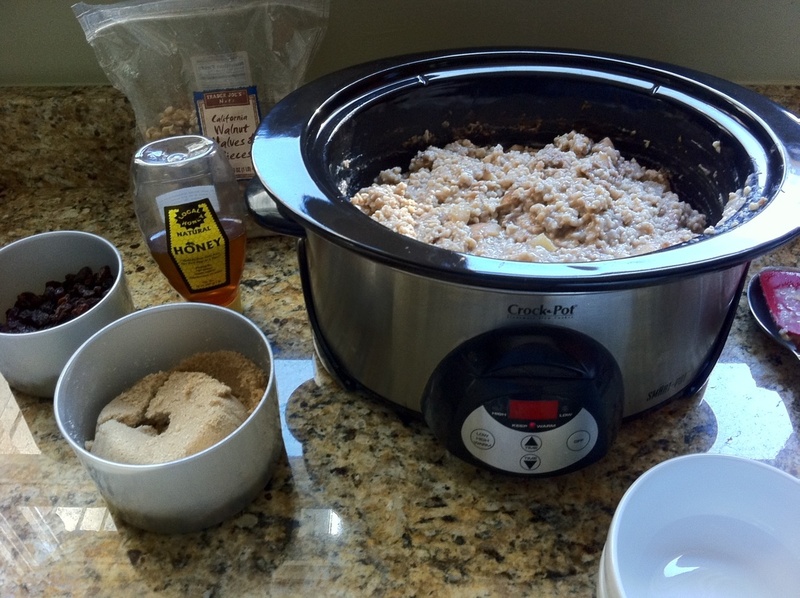 Steel cut oats need to be cooked much longer, which is why the slow cooker is a perfect way to do it!